Happy New Year everyone! Sorry it’s been so quiet on our blog lately, but we’re back in the saddle and ready for 2016. Mark January 28, 2016 on your calendar as Data Privacy Day. DPD is an international effort held annually and organized by the National Cyber Security Alliance to create awareness about the importance of privacy and protecting personal information. DPD is part of a greater effort, the #PrivacyAware campaign, which helps everyone understand how they can own their online presence and reminds businesses that privacy is indeed good for business. At Home … Own your online presence: Help you and your family be #PrivacyAware. Talk to your family and friends about protecting personal information and how to stay safe online. Get started with these tips. One way you can join the 2016 effort is by becoming a Data Privacy Day Champion. DPD Champions include companies and organizations of all sizes, nonprofits, government organizations, schools and school districts, colleges and universities and individuals. Find some tools to promote Data Privacy Day and learn how to get involved and visit www.staysafeonline.org/DPD for more information. Scam artists use clever schemes to defraud millions of people around the world each year. People need to learn how to recognize common phishing tactics and malicious emails and what you can do to avoid them. Scammers typically create emails and messages that look like they’re from real companies, agencies and organizations and even use their logos, fonts, layouts and color schemes. the message is requesting your personal information — do not respond or click links! Companies, agencies (like the IRS, etc.) and organizations will not request your password, user name, credit card data, account numbers, or other personal or financial data through e-mail or text. 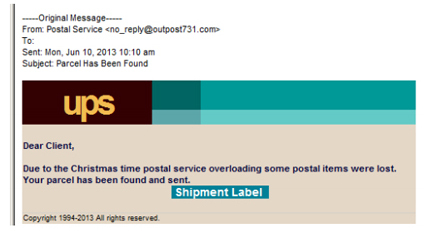 the email or message has several typos, missing data or poor English. If you’re not sure an email is legit, DON’T click any links or open any attachments. Instead, look for signs that the email isn’t the real thing or do a search or visit that company’s site to see if there are any complaints from others who received similar emails. Be on the alert for fake emails posing as online retailers like PayPal, Amazon and others with a subject line similar to a receipt you would see for a purchase on that vendor’s online store, a PayPal payment to someone, etc. These fake receipt emails are sent by cyber criminals — not the retailers — and clicking links contained in a fake receipt email may install malware on your system, in particular spyware used in severe forms of cyber crime such as credit theft, extortion, and identity theft. 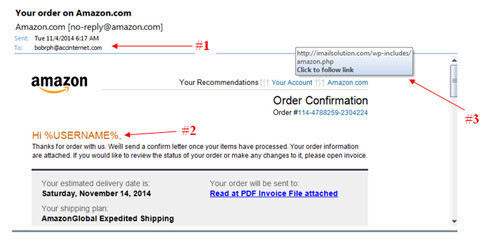 For example, just last week I placed a small order on Amazon and received my order confirmation as usual. The next day I received another Amazon confirmation email for a $1,099 electronic device and the first thing I thought of is someone hacked our account..! 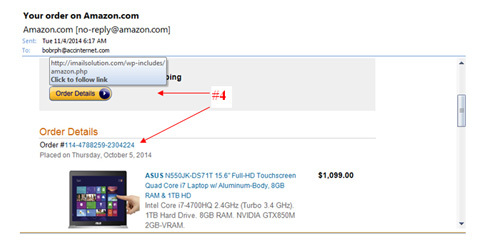 #3 – When you hover the mouse over a link (DON’T CLICK IT – just hover) it displays a website NOT called “amazon.com/…” but rather “imailsolution.com/…”. << We strongly suggest you not visit this site – just in case! Note the email has Amazon’s logo and layout, fonts and color scheme are almost identical to a typical order confirmation email from them so you need to be on guard. #4 – As I scrolled down and hovered the mouse over other links (again without clicking) the same domain / website name kept showing up. 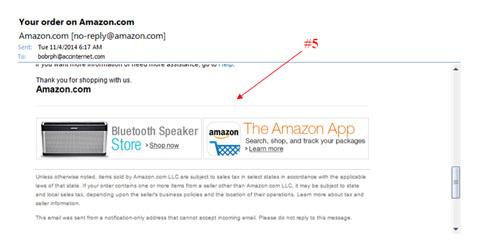 #5 – Whoever designed this email even added a typical footer that Amazon uses on their confirmations. This was just an image (nothing popped up when I hovered over these links), but it sure gives the appearance it is a normal message from them. In another popular method of phishing, an attacker uses a trusted website’s own scripts against the victim. These types of attacks (known as cross-site scripting) are particularly problematic, because they direct the user to sign in at their bank or service’s own web page, where everything from the web address to the security certificates appears correct. A Universal Man-in-the-middle Phishing Kit, discovered by RSA Security, provides a simple-to-use interface that allows a phisher to convincingly reproduce any website and capture any log in details entered at the fake site. It does help to report suspicious emails to the respective company but it is always best to find out how they want you to report it. Some may ask you to forward an email while others prefer you send it as an attachment. Below are some examples of common brands we’ve seen in suspicious emails over the years, and it’s easy to do a search on a company name and the phrase “report phishing” to find their preferred method of sending them the data. Once you report an email just delete it so you don’t accidentally click on any links in it later. Realize you probably won’t hear back from the company you reported the malicious email to, but you will get an auto-reply explaining they received it and will be investigating it. You can also forward phishing emails to phishing-report@us-cert.gov and/or reportphishing@antiphishing.org. The Anti-Phishing Working Group, a group of ISPs, security vendors, financial institutions and law enforcement agencies, uses these reports to fight phishing. File a report with the Federal Trade Commission at www.ftc.gov/complaint . Visit the FTC’s Identity Theft website. Victims of phishing could become victims of identity theft; there are steps you can take to minimize your risk. A serious flaw has been found in a software component known as Bash (Bourne Again Shell), which is a part of many Linux / Unix systems as well as Apple’s Mac operating system. The bug, dubbed Shellshock, can potentially be used to remotely take control of almost any system using Bash, researchers said. The bug, which has gone undetected in the software for at least 22 years, was just disclosed yesterday 24-Sep-2014. 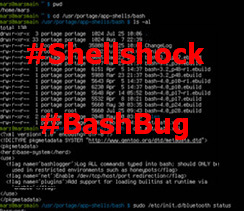 Shellshock rates 10 out of 10 on the scale of vulnerabilities. For perspective, Heartbleed rated an 11 but that bug required more work to exploit holes, whereas Shellshock opens the way for hackers to add and manipulate code or data into “shell” commands. Several exploits have already been identified in the wild (read here, here and here) and some experts are concerned this bug is “clearly wormable” and may get much worse in the coming months. No one really knows for sure how bad things could get with Shellshock, but one thing everyone agrees on is system administrators and developers need to patch this Bash bug asap. There are patches available through the links below and realize there will most likely be a series of patches going forward. US-CERT recommends administrators and users review CVE-2014-7169 in the National Vulnerability Database as well as the Redhat Security Blog for additional details and to refer to their respective Linux or Unix-based OS vendor(s) for an appropriate patch. As of 24-Sep-2014 GNU Bash patch is also available for experienced users and administrators to implement on all current versions of Bash, from 3.0 to 4.3. Kaspersky Labs’ Global Research & Analysis Team has great Q&A about the “Bash” vulnerability with an easy test on how to check if your system is vulnerable on Securelist.com. There is some geek-speak throughout the Q&A but it could be helpful to some techie users and programmers. The patching process for Apple users is described over at StackExchange, but be warned – according to Mashable, it requires a certain level of command line-level knowledge to be applied. For general home users worried about security, watch for updates (esp. OS X and Android users) and pay attention to updates from Internet providers and manufacturers – particularly for hardware such as broadband routers. Also be wary of emails requesting information or instructing you to click links or run software to “fix” this bug. A recently discovered encryption flaw in OpenSSL — a software used by many popular social networking websites, search engines, banks, and online shopping sites to keep personal and financial data secure — has potentially exposed a majority of the internet. Not all secure sites use OpenSSL (a secure site typically has an “https://” prefix and a little padlock in the address line), but about 66% of websites do … so it’s a big deal. The bug is called Heartbleed because it piggybacks on a feature called heartbeat and it affects specific versions of the widely-used OpenSSL cryptographic library. Basically an error that was missed over two years ago in the open OpenSSL encryption protocol allows a remote attacker to expose sensitive data, possibly including user authentication credentials and secret keys which may allow an attacker to decrypt traffic or perform other attacks. In other words, if someone knew this bug existed, they could intercept usernames, passwords, credit card details, and other sensitive information from a website’s server in plain text. It also allowed for a server’s private encryption keys to be stolen. Once stolen, these keys can be used by criminals to decrypt data sent between a website’s server and a user of that website. And, since it leaves no trace, system administrators would have no clue they were breached. What kinds of devices are impacted..? 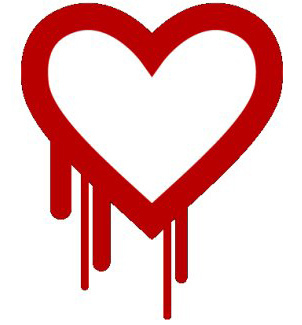 MIT Technology Review explains the Heartbleed flaw could live on for years in devices like networking hardware, home automation systems, and even critical industrial-control systems, because they are infrequently updated. Cable boxes and home Internet routers are just two of the major classes of devices likely to be affected, says Philip Lieberman, president security company Lieberman Software. “ISPs now have millions of these devices with this bug in them,” he says. The same issue likely affects many companies, because plenty of enterprise-grade network hardware and industrial and business automation system also rely on OpenSSL, and those devices are also rarely updated. So what does this mean to me..? If you are a business, a developer or system administrator … upgrading to OpenSSL version 1.0.1g resolves this vulnerability, but realize SSL digital certificates are compromised too so they must be recertified. US-CERT recommends administrators and users review Vulnerability Note VU#720951 for additional information and mitigation details. There is also a way to disable the heartbeat handshake command (although it is best to upgrade) – visit http://heartbleed.com to learn more. Also … once your system is upgraded and recertified, businesses and site owners should notify all users the site is secure and encourage everyone to change their passwords as quickly as possible. For everyone else … there’s not much we can do other than avoid the Internet (okay … so that’s not realistic) … but you can be proactive and verify all the sites you have accounts with are fixed and get ready to change passwords as explained below. 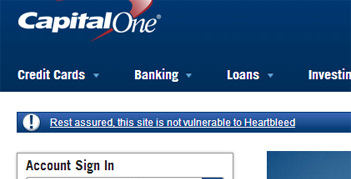 As ZDNet writes… if your bank, favorite online merchant, email, cloud and/or software provider hasn’t fixed Heartbleed yet [or advised that their site didn’t use the buggy version], close your accounts and find new service providers. What can I do to protect myself..? Realize some sites don’t even use OpenSSL, others didn’t update to the 2012 version of SSL so they aren’t vulnerable, and many others have patched the Heartbleed flaw once it became known on April 7, 2014. And hopefully any and all websites impacted by this vulnerability notify users once their systems are updated and recertified and recommend everyone log on and change your passwords. Yes, it is a pain and will be time-consuming, but you should get in the habit of changing passwords every few months anyway. And realize there will be some scumbags who will take advantage of this Heartbleed scare so be on the lookout for phishing emails requesting you click a link to change your password. The best way to ensure the security and integrity of any of your accounts is to go directly to each website and log in there to manage your secure data. Mashable has compiled a Heartbleed Hit List of sites possibly affected by this flaw and advises if you should change your password on sites like Facebook, Instagram, Tumbler, Google, Yahoo mail and more. 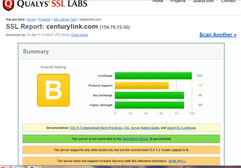 If you’re not sure if a site you use is vulnerable, visit https://www.ssllabs.com/ssltest/ to perform an analysis of the configuration of any SSL web server on the public Internet. (If everything’s green, it has probably been fixed.) Another tool you can use to check sites is http://filippo.io/Heartbleed/. Also, if you use Chrome as your browser, they just released an app called Chromebleed that will test a site before you visit it and display a message if it’s affected by Heartbleed. (Note: Some early reviews weren’t so good so read description and reviews before installing.) But keep in mind these tools are just resources and may not be totally reliable. The best solution is to visit each and every site you use that has sensitive information (e.g. banking, email, social media, etc.) to find out if they have posted a public statement or link about the Heartbleed issue — or maybe they weren’t even impacted or vulnerable — but hopefully they’ll say something online or in a newsletter. If they don’t mention anything about Heartbleed, call, chat or email to ask if they had a problem with it. And if a site was fixed … you should change your password. Many experts suggest the best thing to do is change all your passwords now. BUT… realize you may have to change some of them again since there may be some websites that are still buggy meaning the secure data is still vulnerable. It’s totally your call, but it is wise to change your passwords often anyway … and you really should change them on any and all sites that have been patched. DO NOT use the same password for all your accounts! And make sure all your email accounts have unique passwords since hackers with access to your email can visit other web sites (e.g. banks, Paypal, email providers, etc.) and submit a “forgot my password” request and intercept the email with the reset password. If your password appears on the Top 50 most common passwords that hackers have exposed, make up new ones. Create long passwords (at least 8 characters long) using a combination of letters, numbers and special characters … change them often … and don’t share them with others. Consider using numbers or special characters in place of letters if using words, acronyms or phrases. For example, instead of using “ilovesunnydays” as a password, you could use “1loVe$unnyd@ys” to strengthen it. Pet and family names are not good to use since hackers or criminals may have access to your personal data and/or your posts on Twitter, Instagram, Facebook, etc. Don’t use the “remember my password” option on accounts that contain sensitive data (like credit card data, etc.) since 1) typing them every time can help you remember passwords … and 2) if your PC or handheld device got stolen the perp could potentially access your accounts. Some people invest in password manager services and apps, such as LastPass, KeePass, PasswordBox and 1Password, which keep track of passwords and suggest especially strong ones. However, some security experts warn against creating a single point of potential failure with all your passwords, especially if the service stores your passwords in the cloud. PCMag has some tips on various password managers. Make sure computers and all wireless devices have current anti-virus software and firewalls, schedule them to scan daily or weekly, and update virus patterns often. If you own or manage a business, encourage employees to protect their personal home devices too. Although it is best to not open emails or attachments from unknown sources, that’s not always feasible – especially in the business world. But consider saving the attached files into a temporary directory and scan them before opening. October is National Cyber Security Awareness Month. NCSAM, sponsored by the Department of Homeland Security (DHS) and the National Cyber Security Alliance (NCSA), is a national public awareness campaign to encourage everyone to protect their computers and our nation’s critical cyber infrastructure. Fedhealth is proud to be an NCSAM Champion and we are encouraging everyone to learn more about NCSAM since cybersecurity is our shared responsibility. That means everyone has the potential to make a difference and educate others. Whether you use one computer, a smartphone or a massive network, it is critical to keep systems protected from viruses and attacks. Make sure computers and all wireless devices have current anti-virus and anti-spyware software and firewalls .. and schedule them to scan daily or weekly. Also set virus patterns, operating systems and browsers to update automatically. Encourage employees to protect their personal home devices too. Use long passwords (using both numbers and letters [and special characters if possible]), change them often, and don’t share them with others. Learn more about National Cyber Security Awareness Month at www.staysafeonline.org/ncsam and get involved! You are currently browsing the archives for the cyber category.